So finally her museum has opened in Malaga. The international public don’t seem particularly interested despite the initial free entry and guest appearances of thirty pictures from Tita’s Madrid collection. But the most important event was the subsequent signing of the contract, which should of course have taken place prior to the pictures’ arrival and the museum opening. The spokesman for the United Left in Malaga’s city council, Mr Pedro Moreno Brenes, even went as far as stating that the signature only happened once the town council had agreed to supply yet further millions to cover running costs. According to an article in Diariosur Newspaper it also appears that Mrs Thyssen has the right to remove 10% of the pictures permanently and another 15% for up to nine months. So what the Andalucians believe they have invested more than 36 million Euros in may not be quite what they end up with. Already there seems to be some doubt as to the museum’s potential profitability as six million euros of the investment is infact a subsidy for the running of the museum for the next two and a half years. After which the museum is expecting to be able to self-finance – but only fifty percent of the running costs -, which basically means the council will probably have to invest at least another fifteen to twenty million for the full fifteen-year loan, from which Tita claims she will not receive a penny. At the signing of the agreement a small but vocal group of protesters made their opposition to such extravagance obvious. They were members of a recently formed national group of protesters who are unofficially known as Los Indignados. There is still no news as to why Tomas Llorens and his assistant, Maria Lopez, left the Carmen Thyssen Museum Malaga in such a hurry. One can only presume it was something they considered financially or legally advisable, or possibly both, while Tita must now be somewhat embarrassed by the fact that Llorens remains on the board of the Thyssen-Bornemisza Museum in Madrid. It is also rather confusing that the current director of the Madrid museum, Guillermo Solana, continues to promote Tita’s collections despite the fact that the Spanish government has apparently already succeeded in a legal action regarding the passing-off of the Thyssen-Bornemisza “brand”, obgliging her to call her museum Museo Carmen Thyssen rather than Museo Carmen Thyssen-Bornemisza. God knows how much that cost her to defend or who paid the legal bill for her Malaga venture, considering the tax complications involved with pictures owned by three different offshore trusts! Anyway, Carmen Thyssen has finally confirmed the rumours that she, like Spain itself, is experiencing financial difficulties. She has even warned the Malaga city council that while she is at present loaning her pictures for ‘nothing’ she will eventually, of course, have to receive some form of recompense. There have also been accusations that she has failed to show-up for a number of museum-related, social events. Hopefully because she was busy with more profitable pursuits. Back in June 2010 we predicted that Germany was due to be subjected to a whitewash documentary about The Thyssen Dynasty; made by Broadway TV for transmission by ARD. We hoped our prediction would be proved wrong, but not a bit of it. In fact the program was even more of a ‘hagiography’ than we had foreseen. It appeared to have been yet another attempt by ThyssenKrupp, doubtless with the assistance and encouragement of The Fritz Thyssen Stiftung, to clean-up their past, mainly by omissions rather than lies. Even the members of the Thyssen-Bornemisza main branch of the dynasty were obviously too embarrassed by the whole ghastly project to want to take part. The only exception was Francesca Habsburg who appeared in support of the accusations against Tita Cervera and charges of her responsibility for attempting to steal the family fortune and polute the Thyssens’ ‘noble’ reputation. Meanwhile the same old historical myths were reheated and served up yet again. We were encouraged to believe that Fritz Thyssen had seen the error of his early support of Hitler and the Reich and paid a heavy price for his resistance. No mention was made concerning his tax evasion and illegal foreign currency transactions. They also claimed him to be considered a German hero for opposing the Versailles Treaty, the allied occupation of The Ruhr and the stringent reparation payments imposed by the allies. This was of course hardly something that could be considered unique. In fact Germany as a nation has been ‘somewhat remiss’ in paying their debts for either World Wars. We were also asked to believe that Fritz had really rather liked Jews and even had some as personal friends. At the same time, Heini’s father Heinrich Thyssen-Bornemisza was treated with a great deal less generosity, presumably because, following our revelations, they were obliged to admit that throughout the war he had continued to profit from his industrial contribution in supplying armament for the Reich. It was also made to sound like an activity entirely independent of the Thyssen organisation. Predictably, no mention was made of his banking and financial contribution. They even got Federico Zichy-Thyssen to claim that his uncle’s behaviour had rubbed off on Heini and that his grand-mother had warned him ‘never to do business with Heini’. He didn’t mention that the same grandmother had joined the Nazi party three years before her husband and returned from South America after the war to take charge of the Thyssen organisation and found The Fritz Thyssen Stiftung. But he did remind us how much unhappiness his fortune had brought him and how his children constantly fought over their inheritance; which must have sounded familiar to Francesca. Then the story moved on to the Rechnitz Massacre for which the program makers wheeled in none other than Wolfgang Benz, the retired professor of antisemitism research at Berlin University; the same Wolfgang Benz who originally reacted to my feature in FAZ by denying that the massacre had ever taken place. Making no mention of his original claim, or why he had changed his mind. In an effort to eliminate Margit Batthyany-Thyssen as a suspect he insisted that only uniformed Nazis had been involved in the massacre, though he gave no evidence to support his claim. The program even claimed that Margit hadn’t known about the massacre until she was told the following morning. Paul Gulda, of all people, then insisted that Franz Podezin, one of the main perpetrator, had only been ‘following orders’! He even mentioned the ficticious telephone call that so many apologists claim to have instructed Margit’s lover to shoot the Jews. But the fact that she had helped two of the guilty to escape justice was ignored. I was mentioned as the author of ‘The Thyssen Art Macabre’ which was dismissed by the program as being inaccurate and disregarded by ‘experts’. They also claimed that I had accused Margit of actually shooting some of the victims of the massacre herself, which I didn’t, despite being quite convinced she did, but unable to prove such an accusation. They insisted it was not a book that should be taken seriously, without giving any reason why they were mentioning it in the first place. Broadview TV then moved on to more recent times by claiming that Heini, who Simon de Pury described as the best collector of his time, had ‘donated’ his art collection to Spain, while Francesca insisted that the only reason why the Bermudan court case had collapsed was because his children had withdrawn all charges so that their father could die a happy man, despite Tita’s attempts to get her hands on all his money. Finally the program makers brought ThyssenKrupp back into focus by getting its long-time Chief Executive Dieter Spethmann to say what a deeply wonderful company it was and how much it had contributed to Germany’s wealth, well-being and economic miracle. Since the documentary was shown, the company has announced plans to cut its global workforce by some 25% and admitted that the recent sale of shares was an effort to reduce its enormous debts. It is doubtfull that even such a misleading documentary could have any effect on the fortunes of ThyssenKrupp or the Thyssen families (either Zichy or Bornemisza) but if the program had been more accurate and less misleading at least, ThyssenKrupp, The Fritz Thyssen Stiftung, ARD and Germany’s academia may have retained some degree of credibility. 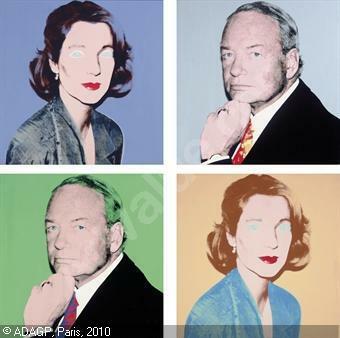 Portraits of Elisabeth and Dieter Spethmann by Warhol.